Peter E. Sargent, dean of the Leigh Gerdine College of Fine Arts at Webster University, has announced that he will step down as dean after 25 years, effective at the end of the 2018-19 academic year. The Leigh Gerdine College of Fine Arts has more than 500 undergraduate students studying majors in the visual arts, dance, music and theatre. The Leigh Gerdine College of Fine Arts was the University’s first named college, in recognition of Dr. Leigh Gerdine at the conclusion of his 20-year tenure as president of Webster University in 1990. A search committee will be established to conduct a national search to identify the next leader for the Leigh Gerdine College of Fine Arts. Sargent holds a BFA from the Carnegie Institute of Technology and an MFA from Yale University. 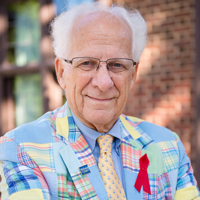 He has belonged to many organizations and received numerous honors for his contribution to the arts and arts education. Among these, he is most proud of the Hall of Fame induction, the Founder’s Award and the President’s Award from the Educational Theatre Association; the Thomas Di Gaetani Award for leadership in theatre technology from the United States Institute for Theatre Technology (USITT); the Excellence in the Arts Award from the St. Louis Council of Arts and Education; and the Achievement in the Arts Award from the Missouri Arts Council. He also cites with pride the on-going success of the Unified Auditions, for which he is the national founder and coordinator; the partnerships fostered between Webster and the St. Louis Municipal Opera (The Muny), The Shakespeare Festival of St. Louis, and the board of the Arts and Education Council. Sargent is the resident lighting designer for Repertory Theatre of St. Louis, which makes its home on Webster University’s campus in the Loretto-Hilton Center. After his retirement as dean, Sargent will return to the faculty in the College of Fine Arts.